If the new trailer for Square-Enix's upcoming DS extravaganza, Final Fantasy XII: Revenant Wings doesn't make you call for mama (in a good way), I don't know what will. 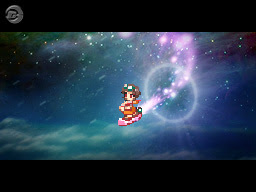 This one shows a number of the game's spells in action. Believe me when I say they are a sight to behold--as are the rest of the title's graphics, for that matter. Actually, you don't need to believe me, do you? Just go ahead and click that little link at the top of this blurb--it'll take you to the video and you can see for yourself. If you're Jonesing for more information about what could be Square's greatest portable title to date (I don't think it's a stretch to imagine that could be true), check out the preview 1up.com just posted. They discuss the intricacies of the game's summon spells, and sound quite impressed overall.